Mobile computing devices like iPhone, iPad, Android and Microsoft devices are bringing technology to younger and younger children. While these devices are great for children for fun and educational purposes they can also potentially pose a danger to their privacy and security, and sometimes to your bank account. However, companies such as Apple have made great improvements to the operating systems of these devices – giving you more and more control over the functions of the device and the content that can be accessed. This short article is aimed at users of Apple mobile devices (iOS) using iOS 6. Whether your child has their own device, or shares yours I hope you find this information useful. You can also download a PDF version of this article for printing. Once you are in the Restrictions Settings you are given a lot of control over the features and functions of your iOS device. Tapping Enable Restrictions for the first time prompts you to enter a Restrictions Passcode. This can be the same or different to your main passcode. This section allows you to control the installation and deletion of apps from the device. Changing this setting to Off will prevent apps from being installed. 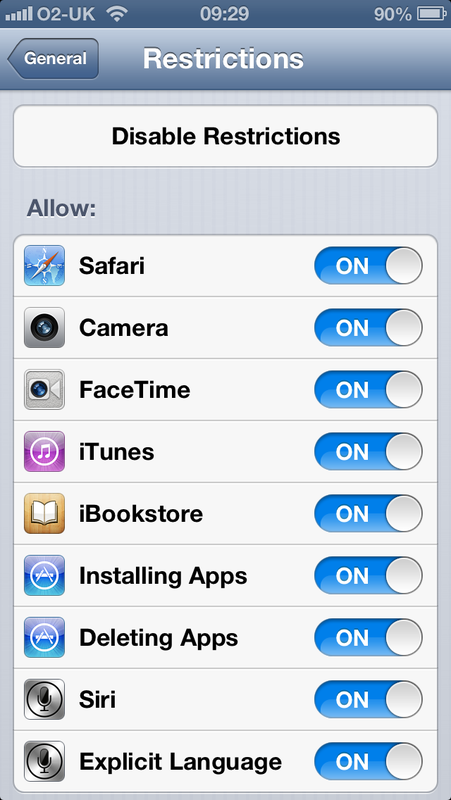 In fact this option will remove the App Store icon from the device. Setting this to off will disable the ability to delete apps. This is useful if you let a child use your device but have found that they accidentally delete your important apps and data. This section gives you control over the type of content allowed on your device. It also lets you to specify the age range of content that you wish to allow. 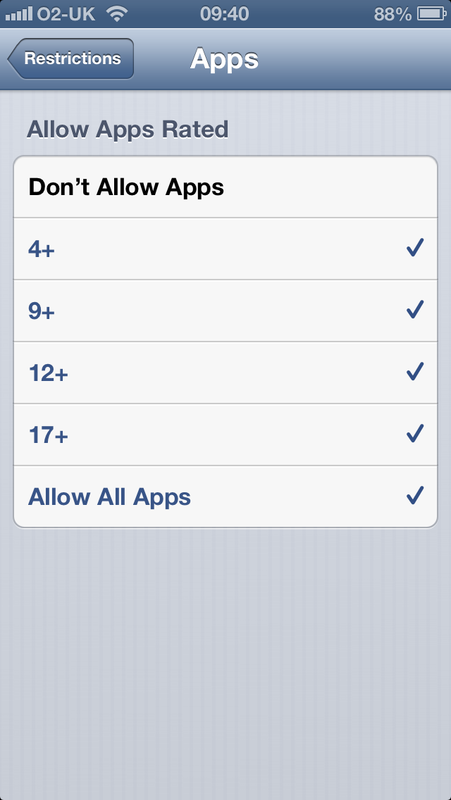 Tap this option to specify the age ranges of apps that are allowed to be installed. For example, if the device is used by a young child you can specify the 4+ age group. Any apps on your device that are not suitable for the age group you specify are hidden and cannot be used. Change this setting to Off to prevent the child from making In-App Purchases. These purchases are commonly used in freemium type apps and games where the software is free or low-cost to install but offers extra paid content. The freemium model is popular because it allows users to download and try software but also allows developers to be paid for their work. However it may not be something you want your children to have unrestricted access to. You have the option to choose between Immediately and 15 minutes. Choosing Immediately will mean your device will request your password each time you make a purchase through the App Store. The second options means iOS will not prompt you for a password for 15 minutes after the last purchase. Thank you for taking the time to read this. In the digital age we live, it is important for children to be familiar with the technology that is defining the future. Technology that is changing lives and empowering people. But dangers exist and I hope you will find the information in this document useful in helping to protect your children when using mobile apps. I believe that with education, awareness and security options in mobile devices – children can reap the rewards of this fantastic technology safely and securely.